Go to original pattern for design DROPS 192-52. Knitted mittens in DROPS Nepal. 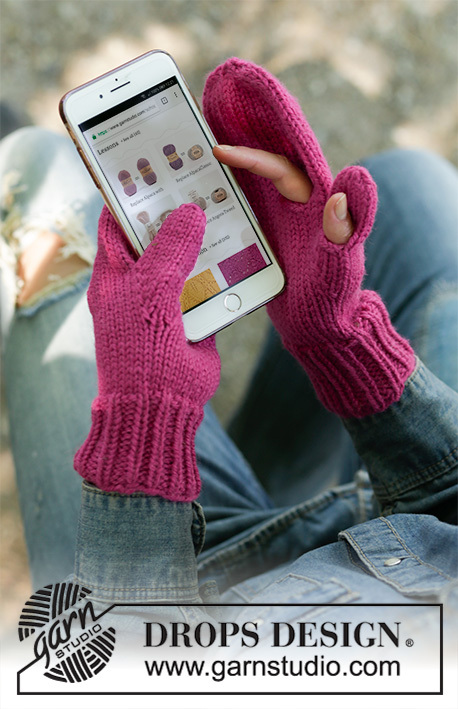 Mobile mittens with opening for thumb and index finger. 19 stitches in width and 25 rows in height with stocking stitch = 10 x 10 cm. DROPS DOUBLE POINTED NEEDLES SIZE 3.5 MM for rib. 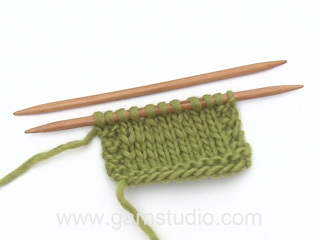 Increase 1 stitch by making 1 yarn over; on the next round knit the yarn over twisted to avoid a hole. Decrease 1 stitch on each side of the marker thread as follows: Work until there are 3 stitches left before the marker thread, knit 2 together, knit 2 (the marker thread sits between these 2 stitches), slip 1 stitch as if to knit, knit 1 and pass the slipped stitch over the knitted stitch. 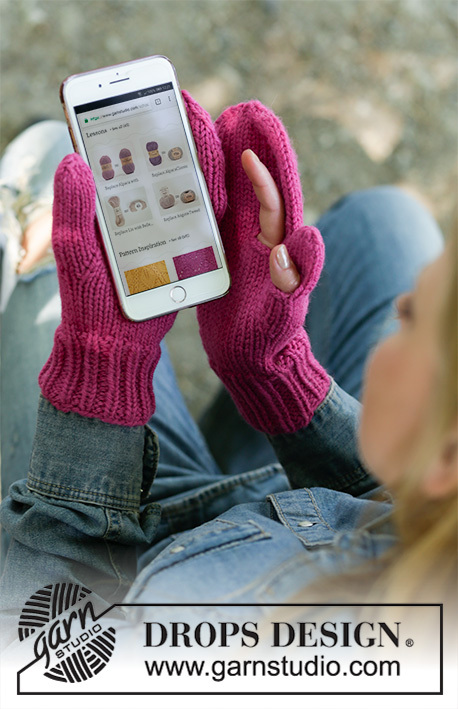 These mittens are mobile friendly and are worked with an opening for thumb and index finger. If you do not want openings for thumb and index finger, you can just continue working in the round without casting off. The piece is worked in the round with double pointed needles, from the rib upwards. Cast on 39-42 stitches with double pointed needles size 3.5 mm and Nepal. Knit 1 round. Then work rib in the round (= knit 1 /purl 2). When the rib measures 6 cm knit 1 round where you decrease 3-2 stitches evenly on round = 36-40 stitches. Change to double pointed needles size 4 mm and work stocking stitch in the round. REMEMBER THE KNITTING TENSION! When the piece measures 10 cm increase 1 stitch on each side of the first stitch on the round for the thumb gusset - read INCREASE TIP = 2 stitches increased. Increase like this on each side of the increased stitches every 2nd round a total of 5-5 times = 46-50 stitches. Knit 2 stitches, cast off 4 stitches for the opening and knit to end of round. On the next round, cast on 4 new stitches over the cast-off stitches = 36-40 stitches on the needles. Continue working until the mitten measures approx. 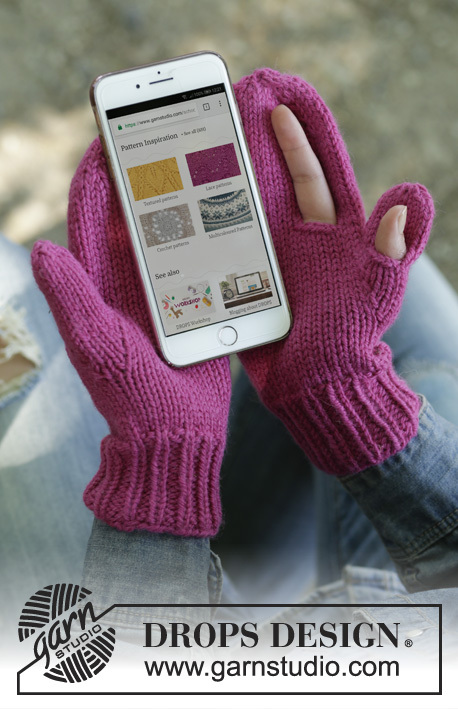 21-22 cm (try the mitten on; there is 3 cm left to the finished length and you can continue if necessary to desired length). Insert 1 marker thread at the beginning of the round and 1 marker thread after 18-20 stitches. On the next round decrease 1 stitch on each side of both marker threads - read DECREASE TIP = 4 stitches decreased. Decrease like this every 2nd round a total of 3-3 times and then every round a total of 2-2 times = 16-20 stitches. On the next round knit all stitches together 2 and 2 = 8-10 stitches left on needles. Repeat the last round one more time = 4-5 stitches. Cut the strand, pull it through the remaining stitches, tighten and fasten well. The mitten measures approx. 24-25 cm from the top down. Start on the inside of the thumb just after the 11 stitches on the thread, knit up 4-5 stitches along the opening for the thumb and then knit the 11 stitches from the thread = 15-16 stitches. Divide the stitches between double pointed needles size 4 mm. Knit 10-11 stitches, cast off 4 stitches for the opening and knit the last stitch. On the next round cast on 4 new stitches over the cast-off stitches = 15-16 stitches. Continue working until the thumb measures approx. 5-5½ cm (try the mitten on; there is approx. ½ cm left to finished length and you can continue if necessary to desired length). 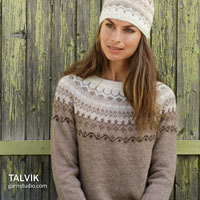 Knit 2 rounds where all stitches are knitted together 2 and 2 on both rounds. Cut the strand, pull it through the remaining stitches, tighten and fasten well. Cast on 39-42 stitches with double pointed needles size 3.5 mm and Nepal. Knit 1 round. Then work rib in the round (= knit 1 /purl 2). When the rib measures 6 cm knit 1 round where you decrease 3-2 stitches evenly on round = 36-40 stitches. Change to double pointed needles size 4 mm and work stocking stitch in the round. When the piece measures 10 cm increase 1 stitch on each side of the last stitch on the round for thumb gusset – remember INCREASE TIP = 2 stitches increased. Increase like this on each side of the increased stitches every 2nd round a total of 5-5 times = 46-50 stitches. Knit 30-34 stitches, cast off 4 stitches for the opening and knit the remaining 2 stitches. On the next round, cast on 4 new stitches over the cast-off stitches = 36-40 stitches on the needles. 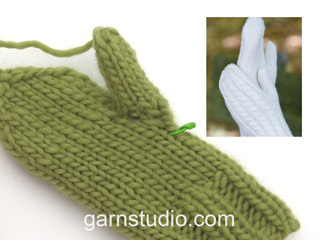 The rest of the mitten is worked in the same way as the right mitten. Start on the inside of the thumb, just before the 11 stitches on the thread, knit the 11 stitches from the thread and knit up 4-5 stitches along the opening for the thumb = 15-16 stitches. 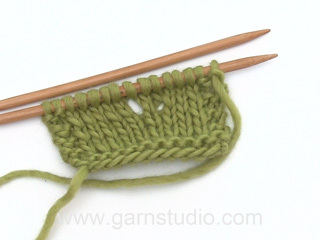 Divide the stitches between double pointed needles size 4 mm. 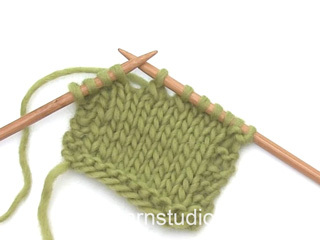 On the next round make an opening for the thumb as follows (if you do not want an opening continue in the round with stocking stitch as before): Knit 1 stitch, cast off 4 stitches for the opening and knit to end of round. On the next round, cast on 4 new stitches over the cast-off stitches = 15-16 stitches. The rest of the thumb is worked in the same way as for the right thumb. Mam wrażenie, że w opisie próbki wkradł się błąd: "Jeżeli masz za dużo oczek na 10 cm, użyj większych drutów. Jeżeli jest za mało oczek na 10 cm, użyj mniejszych drutów." Powinno raczej być:"Jeśli masz za dużo oczek (...) użyj mniejszych drutów, jeśli jest za mało (...) użyj większych drutów. Witaj Margo, opis próbki jest poprawny. Jak mierzyć próbkę znajdziesz TUTAJ. Powodzenia! Désolée et étourdie (!!! ), je viens de voir les explications! Très judicieuse idée de cadeau de Noël, mais auriez-vous un conseil pour réaliser ces moufles pour un gaucher ??? Bravo pour votre site. Bonjour Mme Aidan, suivez les indications MOUFLE GAUCHE AVEC OUVERTURE POUR LE POUCE ET L’INDEX et pour la moufle droite, si vous ne voulez pas l'ouverture du pouce et de l'index, continuez simplement en rond, sans rabattre les mailles de l'ouverture du pouce et de l'index. Bon tricot! Hej. Hur mycket ökar jag när jag gör i herrstorlek. Tacksam för svar. Dejligt at der også er taget hensyn til os venstrehåndede. Om man gör båda vantarna likadana, då kan man tamme17 sticka om vintern.